Give your active-aging clients a research-based, muscular approach to help them prevent falls. Falling is one of the top concerns of our active-aging clients. As a profession, we’ve addressed this issue by encouraging a functional “train-to-transfer” mentality. Fortunately, strategies for balance improvement and fall prevention have come a long way from the single, static “stork stance” so often prescribed just a decade ago. Thanks to a combination of scientific research and success stories of fitness pros working with this population, we know more now than ever. 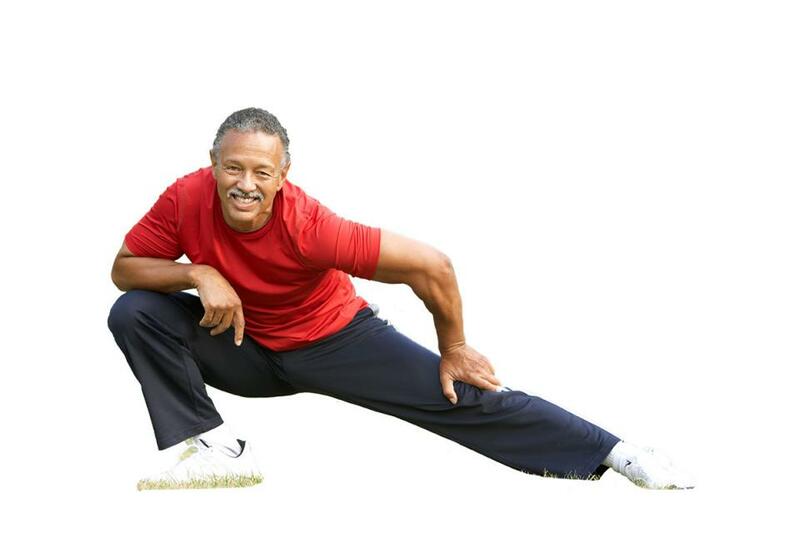 Below, I’ll share some of the most successful methods of fall prevention that my active-aging clients have incorporated in recent years, and I’ll add some research-based, functional movement patterns that you can add to your train-to-transfer protocols. The theory. When choosing skills and drills to prevent falling, the most import- ant muscular areas to target are the slow-and fast-twitch fibers of the anterior tibialis, according to new research by Siddiqui, Arjunan & Kumar (2015). Think of it this way: If an active ager hits a snag in the floor and starts to trip for- ward, the anterior tibialis will actively engage that foot with enough dorsiflex- ion to allow the person to step down quickly in a safe position. To be sure, strengthening the ankle plantar flexors is important, but most training proto- cols that involve movement already do this (Orr, Raymond & Singh 2008). The practical. For seated or standing work, do three sets of 12–15 reps of unilateral or bilateral ankle dorsiflexion at a tempo of 1:2, where the eccentric, lowering phase lasts twice as long as the other, to teach control. For added resistance, self-oppose with one foot or add resistance tubing. To progress, add ankle circles, do eversion and inversion movements with each foot and, if appropriate, advance to a unilateral standing position. The theory The quadratus lumborum engages the spine in lateral flexion and stabilizes gait. While many factors contribute to “senior shuffles,” a functionally strong quadratus lumborum on both sides can help maintain a strong and stable connection between the ribs and the hips, which stabilizes overall gait patterns (Karageanes 2004). The practical. Increase the endurance of the quadratus lumborum by doing standing frontal-plane crunches (with or without the help of a chair). Part 1. To engage in superior frontal-plane lateral flexion, stand on the left leg, lower the right side of the rib cage toward the right stable hip, and return. Part 2. To engage in inferior frontal-plane lateral flexion, stand on the left leg, hike up the right hip as far as possible, and return. Keep the shoulders as stable as possible, as if balancing a glass of water on each one. Part 3. As a full-body progression, still standing on the left leg, combine Part 1 and Part 2, thinking of “squeezing a grapefruit” between the ribs and hip of the moving side, and return. Try each of these for three sets of 12–15 reps per leg. To regress, keep both feet on the floor at all times and/or hold a chair for support. For clients who can handle floor-work, encourage side-lying quadratus lumborum strengthening. Lie on the left side of, the body on a comfortable, padded surface with left elbow and both knees flexed to about 90 degrees. Pad the left elbow and knees if necessary. Open the palm of the left hand for additional stability. Part 1. Pressing into the left elbow and knees with the body’s weight, raise the right hip into the air and lower slowly at a tempo of 1:2, where the eccentric, lowering phase lasts twice as long as the other. Repeat for 12–15 reps.
Part 2. With the hips at their highest point, leaving you in a side-plank position, abduct the right shoulder to form an “L” shape with the rest of the body, and “thread” the shoulder under the body, engaging in transverse-plane rotation of the core. Try to look behind or under you, and return. Repeat for 3–5 reps, depending on your ability to hold the side plank. Part 3. Combine Part 1 and Part 2, keeping in mind this four-part cue: “Hips lift, core twists, core untwists and hips lower.” Repeat for 7–12 reps before changing sides, as able. The theory. For greater self-efficacy vis-àvis fall prevention, all muscles of the lower quadrant must communicate effectively. Recent research reveals that among these, the adductors should receive attention because, as gravity takes over with age, step width increases naturally, strengthening the abductors as a consequence. Combine this with the ubiquitous fear of falling, and shuffling becomes commonplace. As an intervention strategy, adductor strengthening during gait with an inline focus can improve the overall gait system. Inline training challenges the somatosensory system and strengthens the adductors, two benefits of the train-to-transfer approach. Because inline walking strengthens the adductors, training this way can lessen the increase in step width that often accompanies aging (Teichtahl et al. 2009). Inline walking with side step: Stand with feet hip-width apart and arms out to the sides (like airplane wings) to assist in balance. Moving forward, step the right foot onto the floor in the frontal plane with a pause, touching the heel only if possible (to continue to strengthen the anterior tibialis), and then step in front of the left foot about 1 foot away from it, striking the heel down first. Repeat with the left foot, and continue the sequence, moving forward for a total of four steps on each side, as space allows. Turn around and repeat the sequence back to the starting point. To progress, repeat with hands on hips, and/or place the moving foot in front of the stationary foot, trying to touch the moving heel to the stationary toes. Inline walking without side step: Repeat as above without the side step. Stand with feet hip-width apart and arms out to the sides (like airplane wings) to assist in balance. Moving forward, step the right foot onto the floor about a foot in front of the left foot, trying to come down with a heel strike first. Add progressions (see previous paragraph) as appropriate. Removing the frontal-plane step for balance increases the functionality of the inline pattern by making the gait challenging enough in the sagittal plane only. The theory. Fear of falling itself is a risk factor for falls, says Debra Rose in her groundbreaking book Fall Proof! She says that addressing the fear psychologically can increase confidence levels, “constituting an effective way to treat fear of falling” (Rose 2003). This functional approach includes facing the fear, a sort of “run-to-the-roar” philosophy that calls for simulating fall-like actions in order to train ourselves to react. According to research, appropriate training at facilities and in the home can decrease reaction time and improve confidence in one’s ability to overcome the fear. Rose incorporates the following drills to improve reaction time and make just thinking about falling not so scary, since the fear itself becomes debilitating. Leaning tower in the sagittal plane: Stand with feet hip-width apart. Imagine you are a tall tower of stability, connected from the feet all the way to the head. Imagine, too, that you are going to start walking forward, but instead just let yourself slope forward as if you were a leaning tower. You will feel your weight transfer toward your toes. Lean only as far forward as you feel safe, if a bit uncomfortable, and then return to your position of stability. After five reps, imagine you are falling forward as you lean forward, and instead of returning to where you started, make yourself react and step forward quickly with your right foot, putting it down as if to stop your fall. Take a pause to feel your weight transfer forward as you step forward quickly to prevent a fall. Return to standing by leaning backward, bringing your right foot back toward its starting place (a sort of reverse lunge). Repeat with the left foot, and then alternate sides for up to 15 reps per side. To regress, stand a few feet away from a wall or chair in front of you, to give yourself an emotional and physical security blanket. During the movement, look both down and forward to learn how to change gaze and focus. Return to a bilateral, even stance. Complete five reps, and then imagine the falling as before, only this time going to the right side. Instead of returning to where you started, make yourself react and step to the right quickly with your right foot, putting it down as if to stop your fall. Take a pause to feel your weight transfer to the side as you prevent yourself from falling. Return to the bilateral starting point. Repeat with the left foot, and then alternate sides for up to 15 reps per side. To regress, have a chair or wall in front of you to touch for additional security. Putting together research-based moves that decrease the fear of falling and maximize gait efficiency can become an active part of every active-aging movement coach’s approach with clients and classes. To watch a video that explores fall prevention strategies, please see "May 2016 Inner IDEA Web Extra #2".